In a quest to improve my keyboard I have combined the 3Dconnexion SpaceMouse Wireless with the Microsoft Sculpt Keyboard. Why? Because I can. I will call it the #3DSpaceKeyboard. Recently I have bought the SpaceMouse and I was taking it home, to the office, to the hackerspace. What bothered me was the massive weight of the SpaceMouse. Why not embed it into the keyboard so I do not have to carry along the weight. 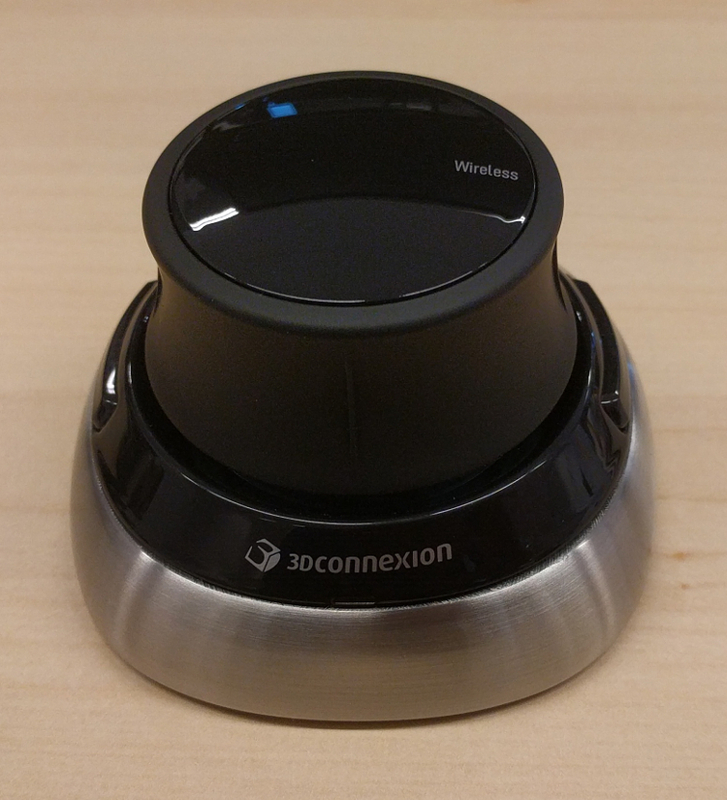 Let me start with breaking down the #3Dconnexion #SpaceMouse Wireless. The PCB is held in place by 3 screws. Sorry I did not make a picture of these screws. After removing them it is easy to unclick the PCB from the rest. The 6 pin header for the USB charge plug I desoldered and I placed a longer ribbon cable between the PCB and the connector. Now the real fun starts. On the bottom under the rubber, you will find screws. Undo them and you can start a partial remove. The padded palm wrest can now be unclicked from the bottom part. Then you get access to the screws which hold the top part of the keyboard to the bottom part. You need to gently unclick the area where the keys are. Make sure to use a soft wedge to prevent damage to the keyboard. It is now also possible to remove the screws of the battery compartment. You need to unsolder the wires first before you can completely remove the blue batteryholder. I put my phone in a RAM mount X-Grip to stabilize it above the keyboard. Then I held the base of the SpaceMouse in place and positioned some post-its on the screen marking the location of the hole to be cut. After removing the base I could directly see where to mark the hole to be cut. Using a Dremel and a Stanley cutting knife I have gone through all layers of the keyboard to make space for the SpaceMouse 😀 Furthermore I have used spray glue to put back the soft padding of the keyboard. In the beginning, you could see the stains of the spray glue, but that disappeared when I used the hot air gun to evaporate the glue residue. Any other sticky parts of the glue you can (in my case) rub off easy. Power for the keyboard came from a battery compartment but I removed that. I soldered the leads of the connector from the keyboard to the 3.3 volt from the SpaceMouse. The battery compartment has been stripped and I milled a hole for the USB charge plug to be accessible. The magnetic lid is now back in business. Sometimes I use my right hand to press keys on the left side of the keyboard. Now I get a reminder not to do that anymore. For the rest, I do not experience the 3D Mouse interfere in the normal operation of the keyboard. Another job finished completely. Maybe I should make the battery compartment a bit more clean with a holder for the USB dongle . .. Very nicely done. I have been thinking about adding a trackball in the middle of a split keyboard. I didn’t make it because I use a number of different mice. Is the SpaceMouse used for 3D design work ? The trackball is a viable option to integrate as well. It keeps you from switching hand positions all the time. Also the backspace is a contestant for moving to that area as well, because that is just out of reach and used a lot (in my case). The SpaceMouse is indeed meant for navigation through a 3D model and have more control over the six degrees of freedom a 3D design has on your computer. Did you add a USB hub to the Keyboard itself? I have the exact keyboard and am trying to figure out how to add one. Do you use the SpaceMouse for general navigation in place of a standard mouse or for its advertised purpose of 3D design? It seems like it would be a very ergonomic option for general navigation but the only comments I see to that effect are that it isn’t /designed/ for that. I’m more interested in knowing whether it’s /effective/ for that.